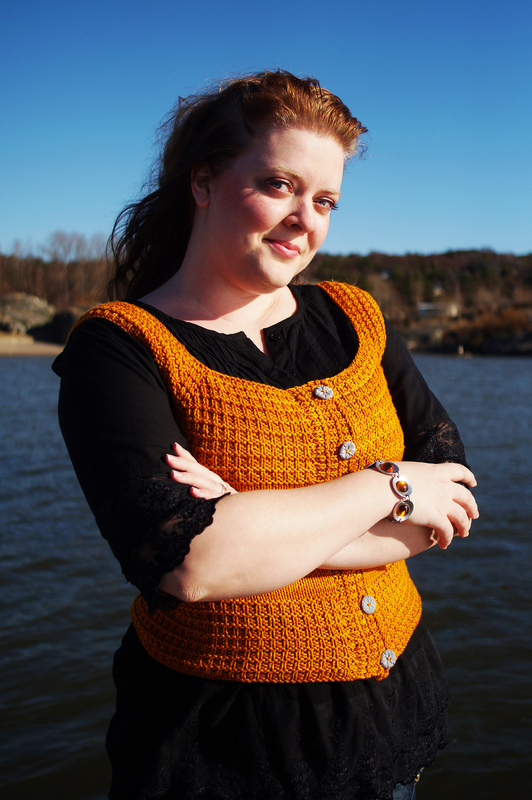 My very first officially published pattern Sinnesfrid, featured on the front page of Knitty, in the autumn 2013 issue. It’s a quick knit that doesn’t require large amounts of yarn, a perfect way to spice up your outfit, and also adds just that extra warmth you need for when the evenings get chilly and autumn peaks around the corner. Not to mention that it can double as a sleeveless top during the summer! With Sinnesfrid, meaning “peace of mind” in Swedish, I’ve incorporated many of the things I love in a knitted garment. The vest is constructed seamlessly, top down, making it possible to try the garment on as you go. The sleeves are completely done when you move on to the next section — no need to return to finish any edgings later! And as the icing on that cake: a simple yet beautiful texture for yoke and edges, and the opportunity to dive deep in your button stash. Make a whole bunch in different colors to cheer up your autumn wardrobe!